3/27/2007Share this story on Facebook! On-screen talent like David Boreanaz ’91 may get more attention from the press, but no television show could air without the combined efforts of writers, producers, and a host of others. We don’t have the space to list all the IC grads busily making things happen backstage, but we can mention at least those who participated in the 58th Primetime Emmy Awards ceremony, held in Los Angeles last August. Five IC grads were nominated for Emmys, and one of them took home a statuette to join the others on his shelf. Chris Regan ’89, a writer for The Daily Show with Jon Stewart, earned his fifth Emmy in the category of outstanding writing for a variety, music, or comedy program. He is a six-time nominee and this was his fourth straight win. › Evan Mediuch ’99, nominated for a fifth year for his work on Survivor in the category of outstanding picture editing for nonfiction programming. › First-time nominee David Rogers ’92, nominated in the category of outstanding single-camera picture editing for a comedy series for his work editing The Office, which took the award for outstanding comedy. › MadTV production designer John Sabato ’80, earning his seventh nomination in the category of outstanding art direction for a variety show, music program, or special. › Five-time Emmy winner Barbara Gaines ’79, who was nominated once again in the outstanding variety, music, or comedy series category for her role as executive producer of The Late Show with David Letterman. 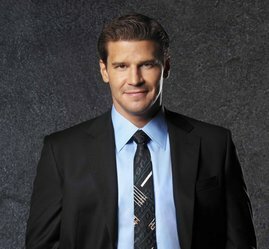 David Boreanaz ’91 has come back from the dead. Well, not really. But the star of the television shows Buffy the Vampire Slayer and Angel is finally playing not a vampire but a living, breathing person. With a legion of fans, great reviews, a prime-time slot, and, of course, an Ithaca College education, it was a no-brainer that Bones, his third television show, would also be a hit. After graduation Boreanaz decided to move to Los Angeles, hoping that his degree would open some doors to working in film or television. It was definitely the right choice, though it took a while for that to become clear. At first he paid the bills by working various odd jobs (painting houses, parking cars, handing out towels at a gym) and acting whenever he could find a job (paying or not). His first break came in 1993 when he guest-starred on a few episodes of Married . . . with Children. Though some cast members reportedly lobbied to make him a regular, he returned to his more familiar recurring role as struggling actor and odd-jobber. He removed “struggling” from his job title in 1997, when a producer noticed the athletic young man walking his dog and cast him as a vampire in Buffy the Vampire Slayer. After he’d appeared as a guest actor in two episodes, the chemistry between him and the show’s star, Sarah Michelle Gellar, was evident; he was written in as a regular. His character, Angel, a 248-year-old vampire looking to redeem himself for his past mistakes, was so popular with fans that a spinoff show of the same name was created only two years later. To say that Angel was a hit would be an understatement; Boreanaz had become a bona fide star. Angel lasted five years, but fans clamored for more of its leading man. Today, if you search for “David Boreanaz” on the Internet, you come up with over a million hits. Brennan (Emily Deschanel). Critics have called the show a cross between Moonlighting and The X-Files, two shows driven by smart, witty writing and palpable chemistry between the two lead characters.